The Underhammer Society is a non-profit association of friends. Our intention is to provide a forum for the exchange of information leading to a greater understanding of and appreciation for the underhammer firearms system. We encourage your submissions of thoughtful comments, photos and experiences pertaining to muzzleloading underhammer firearms. Be sure to check our earlier posts which are archived and may be accessed by clicking the OLDER POSTS link at the bottom right of each page. For some time now I have made reference to a new project which, when completed, I would share with you loyal readers. Well, the time has arrived for the unveiling of my new creation which has taken well over a year to complete when you include the services of the barrel maker, engraver and the casehardening service. So, without further ado, may I present for your consideration my Peerless Faeton™. Through the years of building Zephyrs and now, the Faeton, I’ve wanted to make an English pattern underhammer that emulates the architecture and sensibilities of the fine English sporting rifles of the late percussion period. Many feel that those English sporting guns represent the epitome of gun design and are truly functional art. The Peerless Faeton is the result of my effort to honor those designs of old in an underhammer format. Clicking on any of the photos will enlarge them. Clicking the White X in the upper right corner will return you to the text. 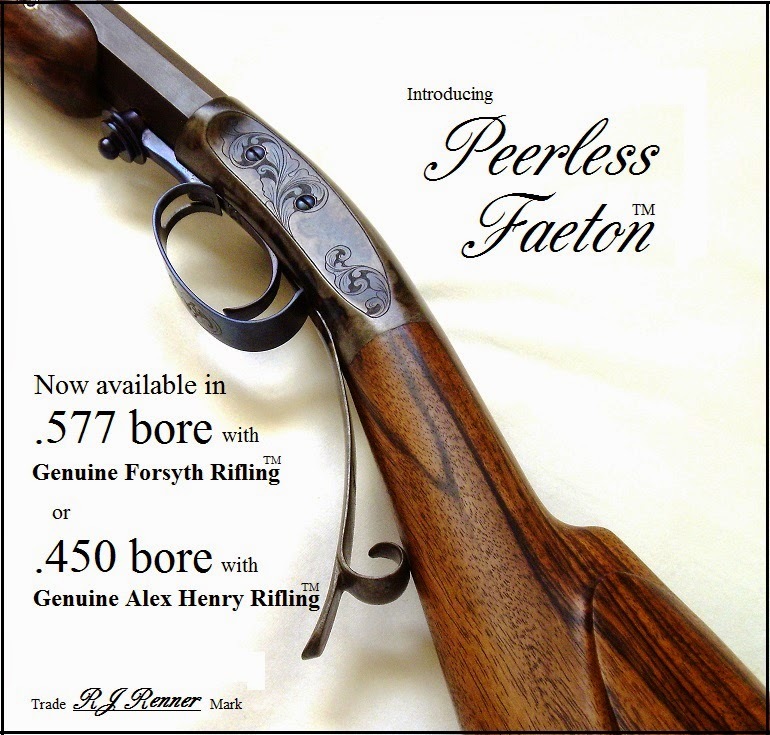 The Peerless Faeton™ is a takedown design which means it also has multi-barrel capability and is available as a high-velocity round ball rifle in .577 calibre with Genuine Forsyth Rifling™, and in .450 calibre with Genuine Alex Henry Rifling™. You may recall that Alexander Henry presented his patented rifling around 1870 and his target rifles beat the pants off the previous champion, the Whitworth rifle, with its hexagonal bore and 6-sided bullet. I have chosen to resurrect the true Henry rifling, that is, with 7 lands and grooves, for those wishing to hunt with cylindrical bullets. 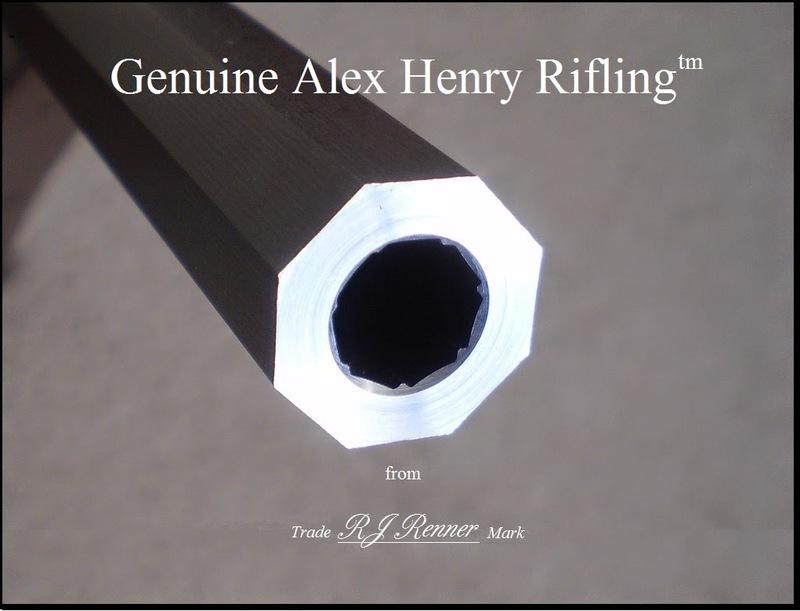 Genuine Alex Henry Rifling™ will also shoot patched round balls with reduced charges for plinking or hunting of small game. Only high-grade English walnut will be used for crafting the Peerless and the forearm is tastefully tipped with ebony. The receiver, triggerguard, patchbox, and buttplate are embellished with restrained engraving and are casehardened. Also available is a fine English-fitted oak case which is available in single barrel or two-barrel configuration. 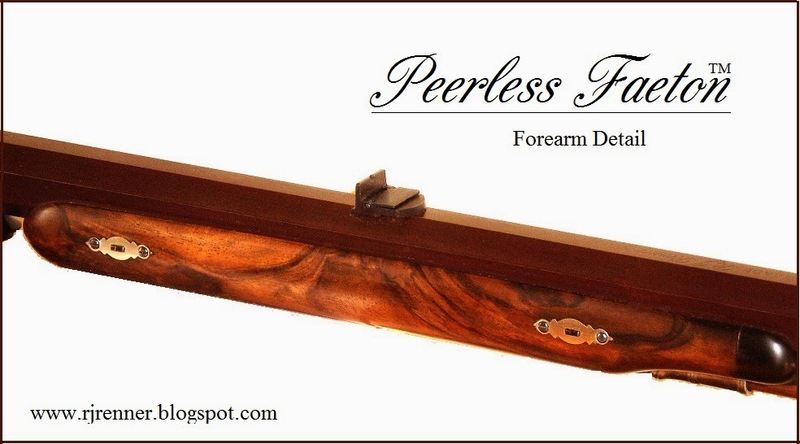 Since the original posting, a customer requested a variation on the Peerless Faeton theme to include a full wood pistol grip with steel grip cap and checkering. Here, then, are a few pics of the results, with which I am most pleased. I would like to say that the English-style checkering was the challenge as most of the checkering people I contacted were not willing/able to accomplish this pattern to our specs. However, Bob Oates of Mt. Pleasant, Michigan rose to the challenge and delivered the service just as I requested. I can wholeheartedly recommend his work for quality, price, and reasonable delivery time. I am glad to have found him and he is now the official checkering artisan for all of my Faeton rifles! You can email Bob at: rdoatesmtp@hotmail.com. Clicking on the photo will enlarge it for closer viewing of the English-pattern checkering. Clicking the White X in the upper right corner of the screen will return you to the text. You really hit it out of the ballpark this time. If I could afford your work I would have two Faetons. But now you make them to swap barrels so I really have to get serious about selling some of my other guns and get a Faeton. My old eyes will no longer let me shoot blade and post sights any more. Do you have an option for a peep sight instead? For some time I have been following your work with great interest because you seem to be pushing the envelope. But, I must say that I am amazed by where you have now pushed that simple underhammer envelope. 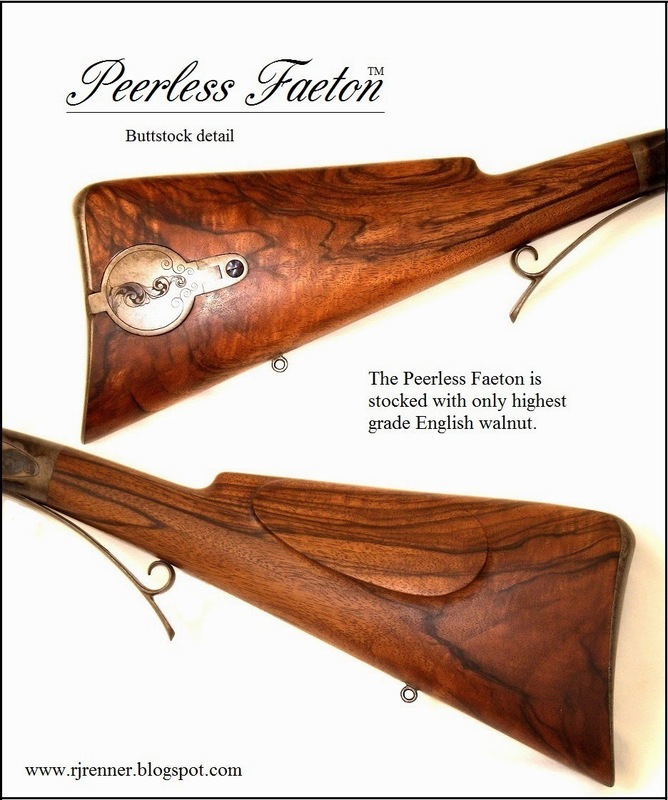 Your Peerless Faeton is one of the most sleek and simply elegant rifles I have ever seen anywhere. Now you have my full attention and I think the time has come to call you and discuss my Peerless Faeton. Thank you, as it was well worth the wait. This site is provided to you free of charge by our sponsors. If you find value in our efforts, please take a moment to visit their sites listed below and consider their products and services before buying somewhere else. 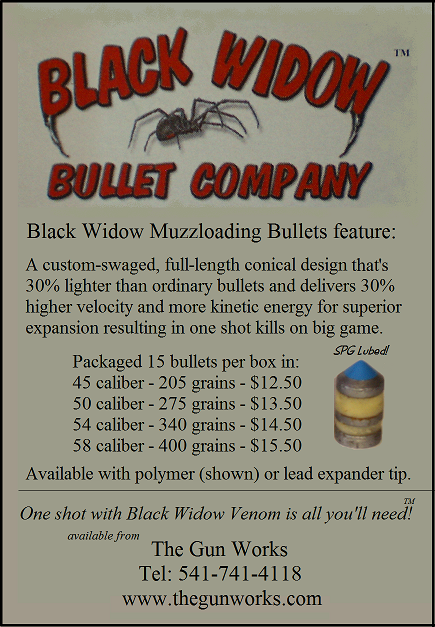 If you are interested in advertising your muzzleloading services or products on The Underhammer Society blog site, please call 775-453-9355 for more information. Copyright 2007 - 2016 by R.J.Renner . Hi. 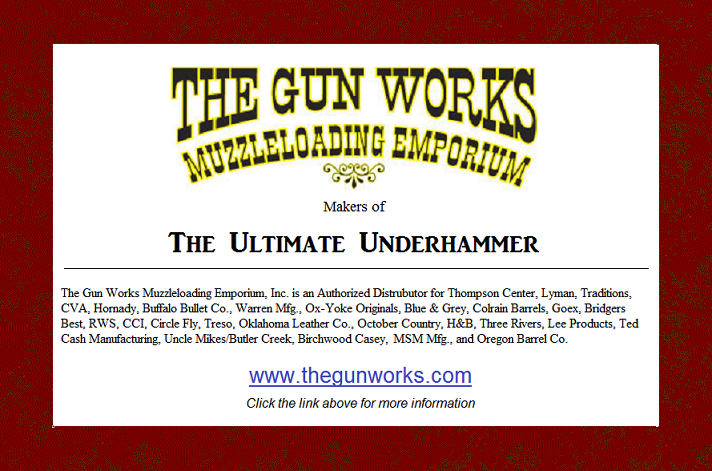 I've been a student, admirer, and designer/builder of underhammer guns for over 30 years. In that span I've built over 200 semi-custom underhammers exploring the possibilities from the ordinary to the exotic. In 1996 I founded Pacific Rifle Company to explore the market's interest in a high-quality underhammer rifle. Thankfully, that interest was, and still is, there. I sold PRC in 2006 but continue to craft high-end underhammers as I am truly afflicted with underhammeritis - which can be contagious!